$85 Billion: Where is the Money Going? There has been a lot of talk in Congress and on this blog about the Obama administration’s pledge to spend $85 billion on nuclear weapons over the next 10 years. To my surprise, very few people know specifically how NNSA plans to use this money. I gave a presentation last week that clarified this issue in the broadest and simplest terms. I am pasting below some of my slides from the presentation with some brief comments for each. 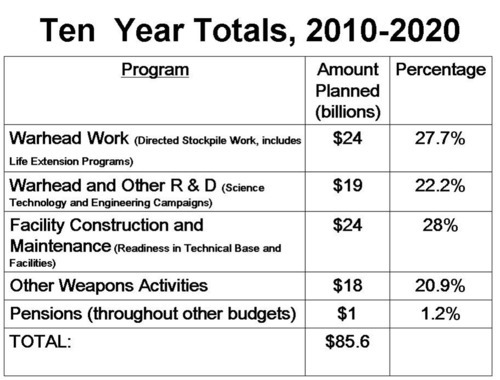 The graph above contains the National Nuclear Security Administration’s (NNSA) twenty-year plan for spending on nuclear weapons (Page 28 of the Stockpile Stewardship and Management Plan). It comes to about $185 billion. Some argue that the estimates for years 2020-2030 should not be considered credible because it is so far in the future. 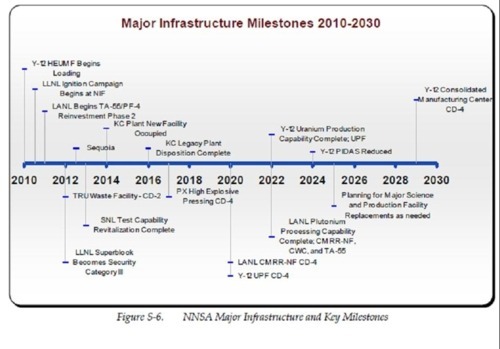 While I agree, the chart does give us some idea of NNSA’s plans for the future. Because the graph is in then-year dollars, the increase reflects the rate of inflation as well as any real budget increases. The budget growth from 2022 to 2030 is consistent with a flat budget and a 2% annual rate of inflation. Table S-1 above and the table below show planned expenditures between 2010 and 2020. Another question that has frequently come up is what is the breakdown for spending on nuclear weapons activities? I created very simple names to describe the budget categories above. The more accurate descriptions are in parentheses. The most common talking point used by NNSA is that most of this money is being spent on aging and dangerous facilities that need to be replaced. As you can see in the chart above, only a little less than 30% of the money is being spent to build new facilities. Most of the money is going toward work directly involving warheads or research and development related to warheads. It is also worth pointing that warhead dismantlement will only make up a very small portion of the “Warhead work”—about $450 million or slightly more than 0.05%. There have also been questions about what fits under “Other weapons activities.” The programs under this category are not insignificant. However, unlike the other categories, there are many of them and they are very different. They include: Inertial Confinement Fusion Ignition and High Yield Campaign, Advanced Simulation and Computing Campaign, Readiness Campaign, Secure Transportation Asset,Nuclear Counter-terrorism Incident Response, Facilities and Infrastructure Recapitalization Program Site Stewardship, Environmental Projects and Operations, Defense Nuclear Security Cyber Security, Science, Technology and Engineering Capability, and Congressionally Directed Projects. The investment in Production Capability is not just to maintain the nuclear stockpile and nuclear complex as it is today. This money is actually facilitating a policy shift in terms of the nuclear “hedge.” More than $10 billion of the $85 billion is being spent on new production facilities that increase U.S. warhead production capacity. This has important implications for how the United States uses its nuclear stockpile. Currently, the U.S. maintains many nuclear weapons in storage, which it could redeploy if there was a geopolitical or technical reason to do so. 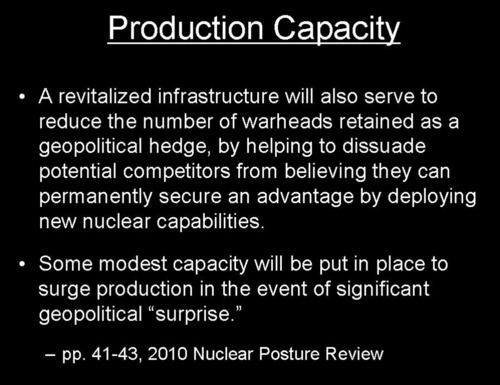 The 2010 Nuclear Posture Review outlining U.S. nuclear policy states that this “hedge” is larger than needed and the United States will “shift away” from relying on it (although it does not explain how or when). Instead, the United States will rely on the threat of warhead production to “dissuade potential competitors from believing they can permanently secure and advantage by deploying new nuclear capabilities.” This would be the first time since the end of the Cold War that the United States used the threat of qualitative or quantitative improvements in the arsenal to dissuade adversaries. Below are a few slides that provide some nitty gritty details on the budget, as well as a timeline for major construction projects within the nuclear weapons complex. The first comes from page 48 of the budget request for Fiscal Year 2012. The second can be found on page 24 of the 2010 Stockpile Stewardship and Management Plan summary. 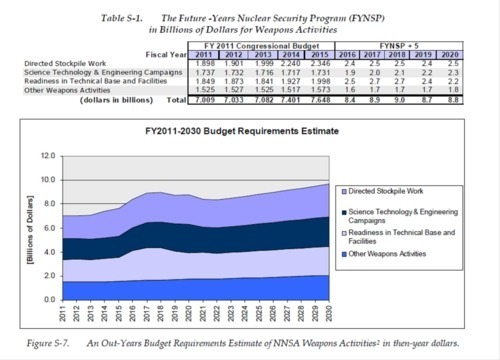 I don’t have a lot to say about these other than that the actual budget numbers for future years will be larger than this and that NNSA is already behind on this timeline.